Locking Hearts Together: It's Your Life... Own It! 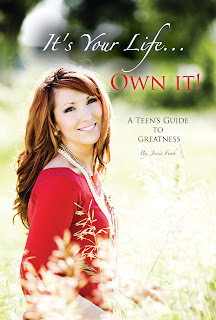 Jessie Clark, now Jessie Funk has turned from releasing music to writing motivational books, specifically for youth. I got my, surprisingly, autographed copy from Jessie Funk telling me to remember the power I have. This book includes personal stories from Funk, activities, and motivational quotes. Her book is broken into 10 parts, with an intro activity called Frisbee Face.